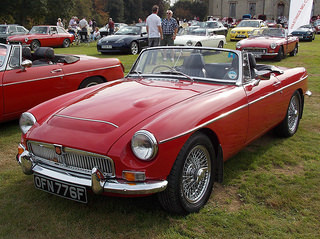 The MGC sports car. In 1967, as a result of declining sales, it was decided to discontinue the Mark 3 Austin Healey 3000 sports car. As early as 1963, the idea of adding significantly larger engines to the MGB was being seriously considered since its monocoque construction would easily handle such a unit. In this way, a derivative of the original MGB, with greatly enhanced performance, would be produced. Accordingly, what seemed a natural choice was to add the 3 litre, 6-cylinder, overhead valve unit from the Big Healey. However, on closer inspection, it was decided that, in its current form, this engine was unsuitable. Consequently, the task of redesigning it was put in place. One of the biggest hurdles to overcome was that its weight, at over six hundred pounds, was excessive. Following much development work, it was found that the overall weight could only be reduced by some forty pounds, which meant that it was still over two hundred pounds heavier than the B-Series unt it was designed to replace. The redesigned engine now had the benefit of a crankshaft with seven main bearings, a marked improvement over the four bearings in the original Austin Healey engine. The benefit of this was that it should allow smoother running at higher revs. However, what was probably the greatest achievement was that the length of the new engine was reduced by nearly two inches, which would just allow the unit to fit into the engine bay of the MGB. Further, the existing bonnet would no longer close since it was necessary to reposition the radiator, whilst one of the two SU carburettors protruded too high. This was overcome by modifying the bonnet so that it contained a distinctive, wide bulge to clear the radiator, together with a small raised area in the shape of a teardrop to clear the carburettor. 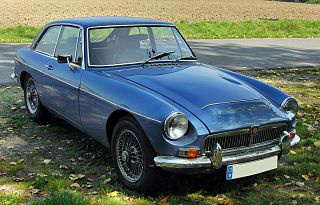 With this sports car having been designated the name MGC, not surprisingly, it looked remarkably similar to the MGB and, in fact, shared practically all the body panels and many of the other components. The redesigned engine developed 145 bhp, an increase of some 53% over that produced by the original B-Series unit. It received a new gearbox, which had synchromesh on all forward gears, that was also fitted to the Mark 2 version of the MGB. Due to the size of the new engine, it was necessary to substantially modify the front suspension by replacing the coil springs with torsion bars, which would result in a stiffer suspension than that of the MGB, as well as adding an anti roll bar. In order to cater for the additional weight of the new engine, telescopic dampers were added. Small changes were also made to the rear suspension, which retained a live axle with leaf springs. The brakes were beefed up with Girling, servo assisted, eleven inch discs at the front, and nine inch drums at the rear. The wheels were increased from fourteen to fifteen inches, together with five inch rims. The back axle was uprated, and a Laycock-de-Normanville overdrive, which operated on the top two gears, was offered as an optional extra. 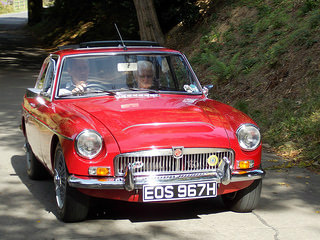 The MGC sports car was finally launched in 1967 to coincide with the withdrawal of the Big Healeys. 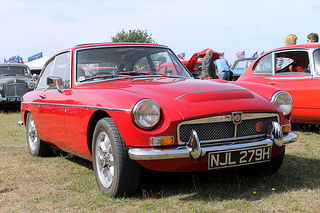 Externally, the only way to tell it apart from the MGB was the wide bulge on the bonnet containing a chrome strip that made it more distinctive. It was available as a two seater convertible and a fixed head coupe. A disappointing feature of the engine was the lack of torque at low revs and its reluctance to rev freely. Unfortunately, but not surprisingly, the production run of the MGC lasted only two years, in which time 4,542 of the convertibles were built together with 4,457 of the GT's. As a result of these adjustments, the original output bhp and torque could be increased by anything up to 30%. 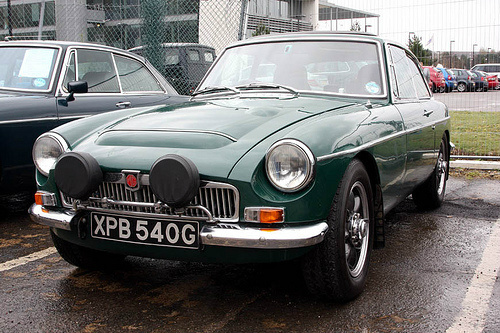 A 1967-69 MGC, in good condition, would fetch between £9,000/$14,000 and £15,000/$24,000, whilst a really superb example would command in the region of £35,000/$56,000.